Many people don't stop to think about the fire hazards that are not as obvious in such places as stoves or fireplaces. 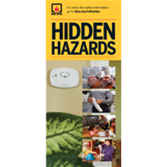 Now, with these NEW Hidden Hazards Brochures from NFPA®, you can spread the word about the often forgotten, and overlooked hazards. How many people do you think know that 9-volt batteries can be a fire hazard? What about the compact fluorescent light bulbs (CFLS) that contain mercury and, if broken, are hazardous? Don't forget about the lint filter in the clothes dryer or the closet that contains the water heater. They are very real dangers, and pose hidden hazards that many people don't know about or simply don't consider. Use NFPA®'s Hidden Hazards Brochures as handouts at community events, fire station, or at safety seminars.